two generations. two voices. one blog. I made this dress a solid month or so ago, and it’s been waiting to be photographed along with a million other things (at least three), but it wasn’t until the light was starting to go this evening that I had the brilliant idea of tying my camera to my bike basket in lieu of a tripod. I have been really eager to talk about this pattern, because apparently, I would be one of the first sewing bloggers to do so. When I first began to admire this pattern from afar, I went looking for reviews, and I only found one, at Cotton Creek Sewing. 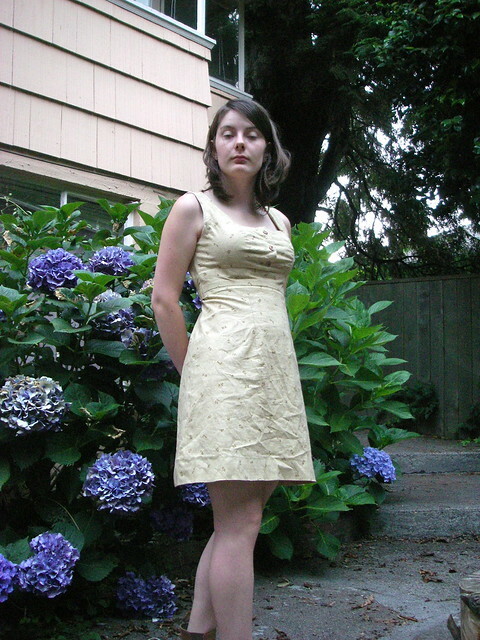 I didn’t understand why the entire sewing blogosphere wasn’t full of Ashlands, it seemed such a simple, everyday dress. Being poor, I didn’t buy it, but Mother did, and when she didn’t like it, she gave it to me. I was more than happy to take it off her hands, and made grand plans for the dozens of versions I would whip up in happy afternoons. In the end, I only made one, and I don’t have plans for another right now (though I still have the pattern, so you never know), because ultimately I found it a little disappointing. Don’t get me wrong, it’s cute and wearable and an easy summer dress, it’s just not quite the paragon of pattern-drafting that I had hoped it would be. To begin with, the multitude of options is a bit baffling. Do you want the sleeveless bodice, or the one with sleeves, because they’re different pieces with different amounts of ease. Do I wear a C cup with sleeves, but a D cup without? Or D cups all round? Or C cups all round? Should I cut a size 4, C cup, or a size 2, D cup? Or a size 2, C cup? The amount of muslins required just to get the right size would be staggering. I did several tissue fittings and ended up cutting a size 2, D cup, and by this time I was frustrated enough that I didn’t even care if the finished dress fit, so I skipped a muslin and plunged on ahead. Luckily, it fits. Well enough, anyway. The saga of fit is long and arduous, I’m always agonizing about it, and sometimes it’s nice to accept that the fit on a dress is not perfect and doesn’t need to be, and I can wear it anyway. 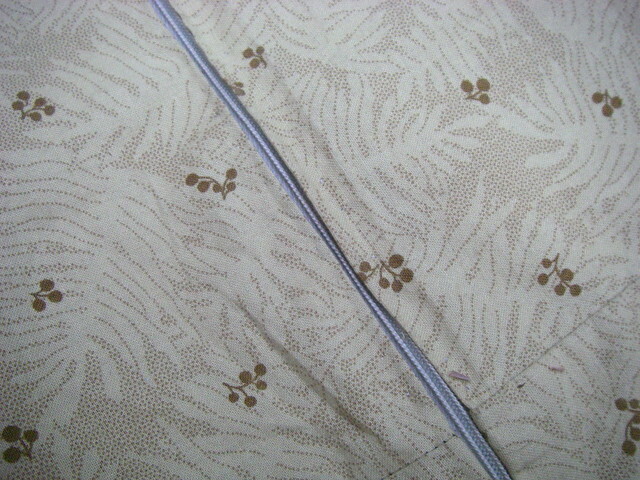 I did a tiny dart tuck in the back to accommodate the roll of my shoulders, and called it good. Also, I accidentally cut both back skirt pieces facing the same direction. I was cutting this dress out of the salvaged remains of last summer’s princess-seamed dress, which I wore all fall and winter and which ultimately, tragically, shrunk in the wash. This meant that I didn’t have nearly enough to re-cut a skirt piece, but I trimmed the back pieces down and sewed them without darts, and somehow it all worked out. The Ashland dress has you do a lot of hand-sewing, and most of it before you’ve sewn up the side seams. This was nice because it forced me to take me time, and led to a nice clean finish, but I was terrified that the dress wasn’t even going to fit and it would all be a waste of time. I compounded issues by handpicking the zipper, since I didn’t have an invisible zip or brown thread, and didn’t want my stitching to show. Inside front, self-faced and tidy. Inside back. I also didn’t have a brown zipper, so I used a grey one. It’s all neutral, right? 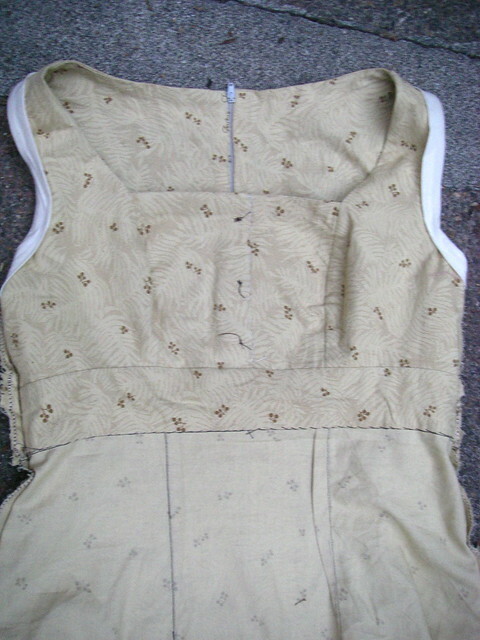 Armhole binding. 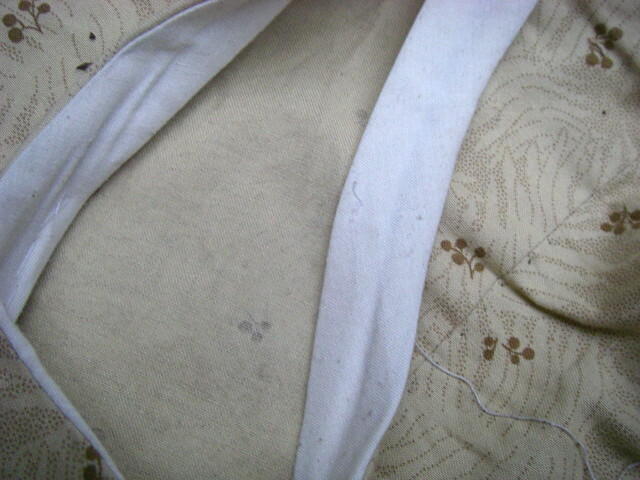 I didn’t have enough brown sprig for bias binding, so I used muslin. 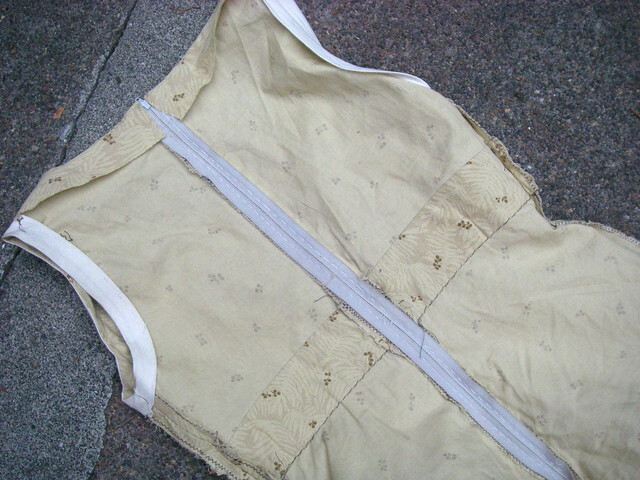 I tacked it down at various point along the armhole, but didn’t bother sewing it down all around. This was the first time I handpicked a zipper properly, and it’s magical. It’s like it’s floating there without any stitching at all! I was so enchanted with prick-stitching, I went on to prick-stitch the entire hem. 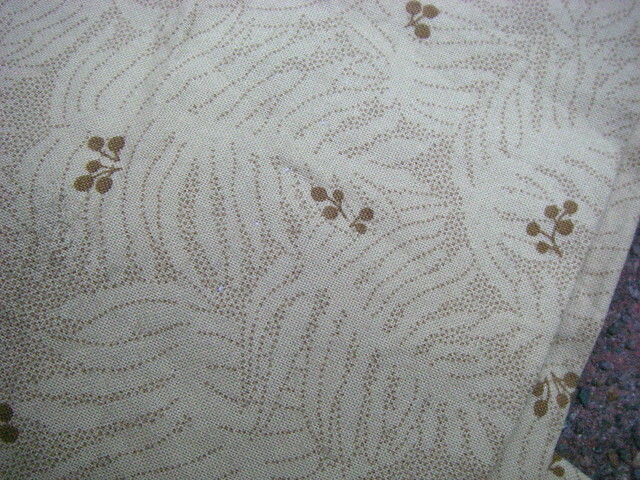 The hem is nice and deep, and the skirt is very short. It felt like the most flattering length at the time. I’m not sure now that it wouldn’t benefit from an extra inch, and it would certainly make water fountains easier, but oh well. 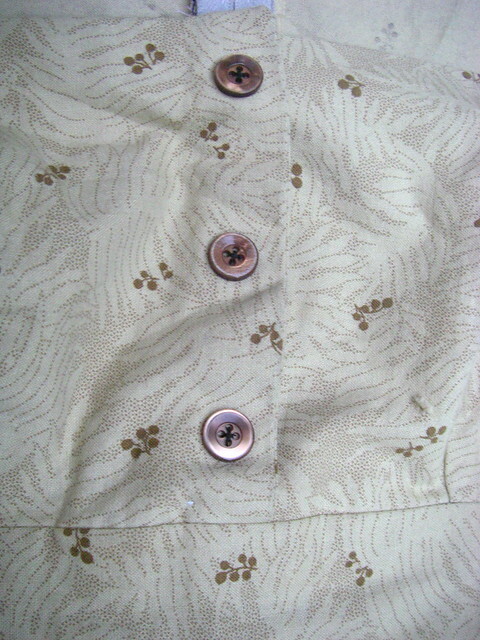 The pattern calls for five buttons, but I only had three matching brown ones, and I didn’t want to make buttonholes anyway, so I sewed the front closed and stitched the buttons through both layers. My new zigzag machine may do buttonholes, but I haven’t figured out how quite yet. Also, you may notice that this is no longer the beautiful college campus, but in fact a pinkish house with hydrangeas! This is my new house, where I will live, hopefully, for the next couple of years! I still get to see the beautiful college every day, but now I have a patio, an herb garden, a kitchen that I only share with four other people, a sewing room, and I don’t have to shuffle in and out every couple of months and listen to people rapping upstairs every night. Hooray! 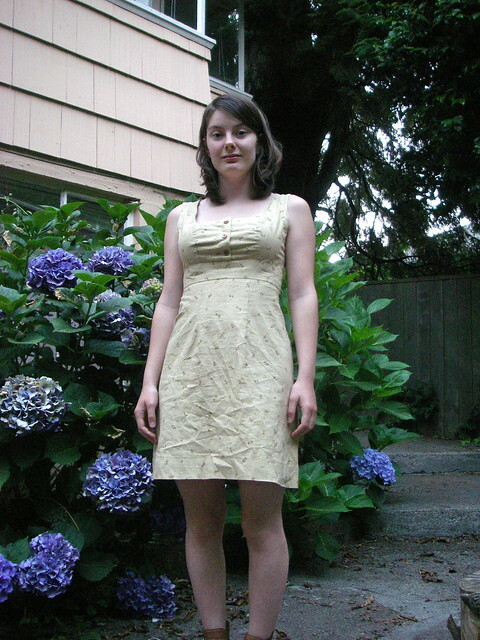 This entry was posted in sewing and tagged Ashland, cotton, dress, my house, Sew Liberated, sewing, sprigged, summer on July 27, 2013 by Alice.